Asus unveiled a new lineup of laptops at IFA in late 2018, showcasing three new models in the premium ZenBook series. 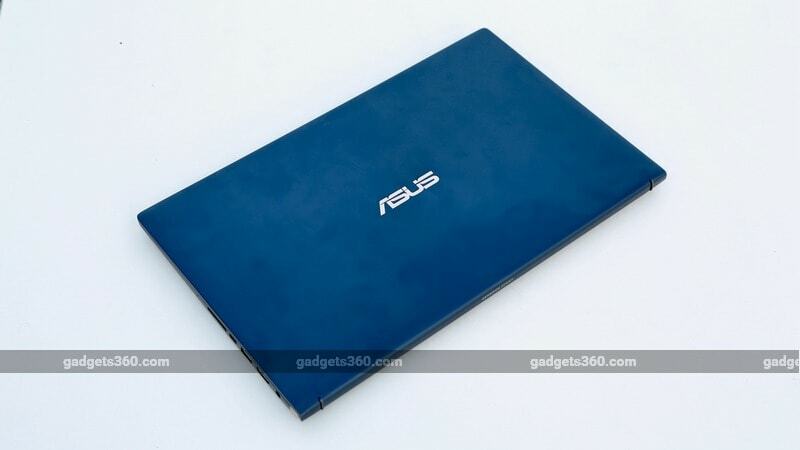 While the ZenBook range has always focused on sleek design and powerful hardware, this new generation of laptops has managed to take Asus' aspirations to a different level altogether. Sturdy military-grade metallic bodies, impressively small profiles, powerful 8th Gen Intel processors, and gorgeous displays with very narrow bezels are among the traits that make these new ZenBooks truly stand out. There is a lot to like about the new Asus ZenBook 15 UX533F, from its refined design to powerful hardware. But is the new Asus offering worth the hype, and more importantly, the premium price? Let's delve into the review and find out. The Asus ZenBook 15 UX533F's design can best be described as graceful and modern. The new Asus offering inherits its predecessors' ZenBook DNA with sharp edges and a signature brushed metal finish with concentric circles, but at the same time, it also introduces a few aesthetic tweaks of its own giving it a distinct identity. For example, the surface finish on the lid is considerably smoother with less lustre to it than we've seen before. The entire body has a matte finish, which gives it an understated look. Asus is offering the ZenBook 15 UX533F in Icicle Silver and Royal Blue, and we think the latter option looks more premium. Thankfully, Asus has not gone for garish gold accents here, a design choice that failed to impress us with the ZenBook UX580GE and the ZenBook 3 UX390UA. Asus is apparently not done with flashy elements completely, though. There's a rose gold strip above the keyboard, and a similar shade has been used on the keyboard keycaps. The contrast with the Royal Blue body stands out, and some people might find this very attractive. The stickers, however, spoil the look to a small extent. Now let's talk about the first thing that will impress users when they power on the device — the display. The ZenBook 15 UX533F flaunts a 15.6-inch display with very slim bezels on all sides — 'Nano-Edge' in Asus' words. The side borders are just 3mm thin, while the top and bottom ones measure 6.4mm and 4.5mm respectively. This has helped Asus cram a 15-inch panel into a body the size of a conventional 14-inch laptop, and the effect is stunning. One good thing is that the webcam is still located above the display, unlike its awkward placement at the bottom as we've seen with some other laptops such as Dell's popular XPS series. 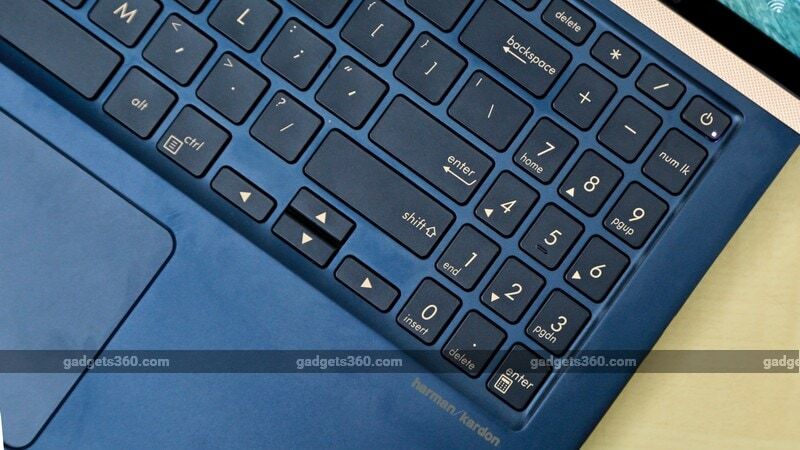 Talking about the keyboard, there is a dedicated number pad, which is always a good thing to have at one's disposal, although it means there's no need for the LED-illuminated number pad built into the trackpad of the smaller ZenBook 13 and ZenBook 14 models launched alongside the ZenBook 15 UX533F. The keys offer 1.4mm of travel and there is a decent amount of space between them, making for a comfortable typing experience. The placement and the smallish dimensions of the direction keys might pose some issues while typing, and so might the awkward placement of the + (Plus), - (Minus), and the second “Enter” key on the number pad. Overall, though, typing on the ZenBook 15 UX533F's keyboard was comfortable and easy, with just the right amount of resistance required to register input. A noteworthy drawback, which could be a major red flag for prospective buyers, is that the keyboard deck and palmrest area flex easily on the application of a small amount of pressure. 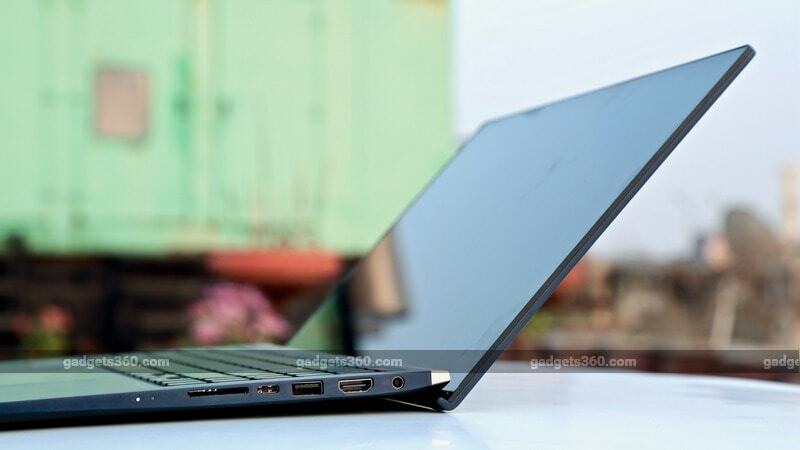 The flex is particularly noticeable in the centre of the keyboard, which does not bode well for a premium laptop. At least the body doesn't creak. As for the lid, it does bend a little, especially when pressure is applied to the centre. The lid edges, on the other hand, are quite solid. But despite the slight flex exhibited by the lid, the display doesn't warp and there is no distortion in colour of the on-screen content. What we noted is that the ZenBook 15 UX533F can be carried in a backpack with a few books without having to worry too much about the load possibly causing any damage to the laptop. However, it would be a better idea to keep the laptop covered in a sleeve to avoid any scratches on the metallic body. The overall profile of the ZenBook 15 UX533F is quite small for a laptop that packs a 15.6-inch display, and the uniform weight distribution makes it easy to handle too. Asus claims that the ZenBook 15 UX533F is the smallest 15-inch laptop out there. It tips the scales at just 1.67 kg and measures 35.4cm x 22cm x 1.79 cm. In comparison, the new Dell XPS 15, which also features impressively thin bezels, is still heavier and larger than the Asus ZenBook 15 UX533F. The new Asus offering is a breeze to carry around and won't feel too heavy in a backpack. The Asus ZenBook 15 UX533F is available in a single configuration in India at the time of its launch. It's powered by an 8th Gen quad-core Intel Core i7-8565U processor (based on the Whiskey Lake architecture) with a base speed of 1.8 GHz and a turbo frequency of up to 4.6 GHz. This is paired with 16GB of LPDDR4 RAM (2400 MHz) and a 1TB PCIe SSD which is claimed to be among the fastest in its class. In the graphics department, you get an Nvidia GeForce GTX 1050 GPU using Nvidia's Max-Q design optimisations, with 2GB of GDDR5 VRAM. 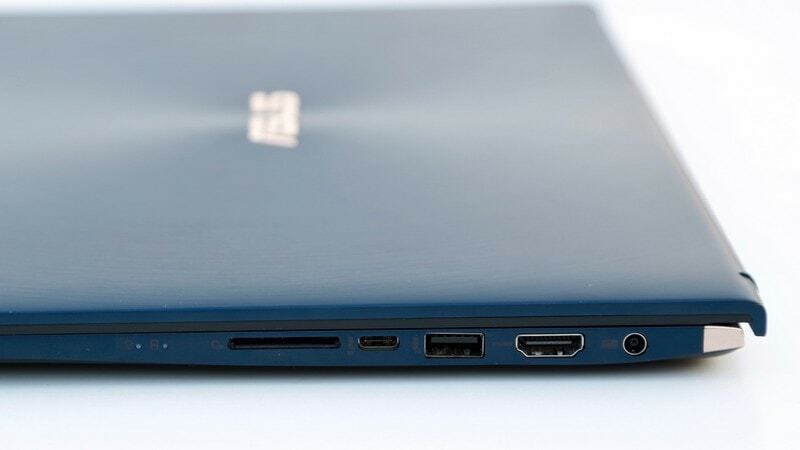 The ZenBook 15 UX533F comes equipped with a 73Wh 4-cell Lithium-polymer battery and ships with a 90W power adapter. All this hardware comes at a steep price of Rs. 1,39,990. A quick look at Asus' official website suggests that the company also offers lower-end variants in some markets with the 8th Gen Intel Core i5-8265U processor, 8GB of LPDDR4 RAM, and 256/ 512 GB PCIe SSD. The company has not confirmed whether these options will be offered in India in the future. The GPU might seem relatively underpowered for a laptop at this price, but it is a lot better than the integrated Intel GPUs you get with most laptops this thin and light. For that price point, you can get a decent gaming laptop with a beefier processor and better graphics, but that would mean sacrificing the ZenBook 15 UX533F's portability. Windows 10 Pro handles things on the software side. 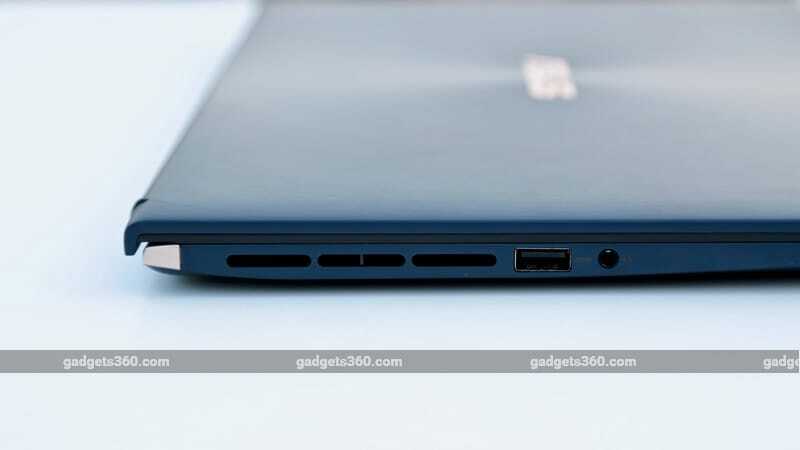 Asus ships this premium laptop with some of its own apps such as Asus Battery Health Charging for power management and Asus Splendid for a better audio-visual experience. The Asus Quiet Fan app lets you raise the fan speed manually to offer a performance boost during intensive tasks at the cost of fan noise though. A host of other apps are bundled as well, but most don't seem particularly useful. Before we start discussing the ZenBook 15 UX533F's processing and graphics grunt, let's shed some light on its audio and display quality. The laptop's 15.6-inch display has a full-HD resolution and 178-degree viewing angles. It's capable of reproducing 72 percent of the colours in the NTSC gamut. The ZenBook 15 UX533F's display is quite reflective and outdoor visibility is not very good. Using the laptop outdoors in sunlight wasn't very pleasant, even with the brightness cranked up to the maximum. 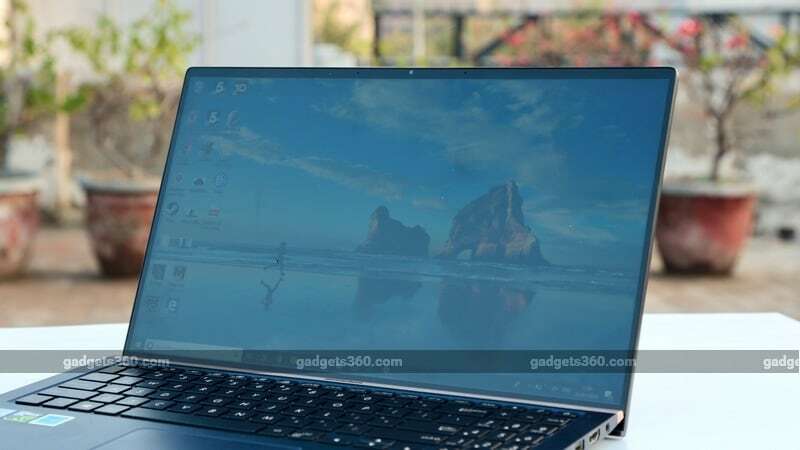 The screen looked dim and a tad dull under direct sunlight, but then, there are not many laptops out there whose displays would fare significantly better under the circumstances. As for audio performance, the ZenBook 15 UX533F shone in some ways and faltered in others. The device features twin Harman Kardon-certified speakers backed by a dual-channel smart amplifier with Asus' proprietary SonicMaster technology. The ZenBook 15 UX533F's speakers offer a balanced audio profile with clear vocals, but that is only when the volume stays below 50-60 percent. Cranking the volume up beyond that level creates very noticeable distortion. Also, while most songs and videos sound good, bass-heavy tracks and heavy action scenes in videos or games fell short of our expectations and sounded tinny. When it comes to browser-based benchmarks, the ZenBook 15 UX533F scored 249 in WebXPRT 3, and 656.1 in Basemark Web v3.0. Moreover, the device sailed through Blender's BMW27 rendering test in around 10 minutes and 25 seconds on average. We were able to compress a 1.3GB file using 7zip in just 59 seconds. Another area in which the high-end Asus laptop shone was its super-fast storage. 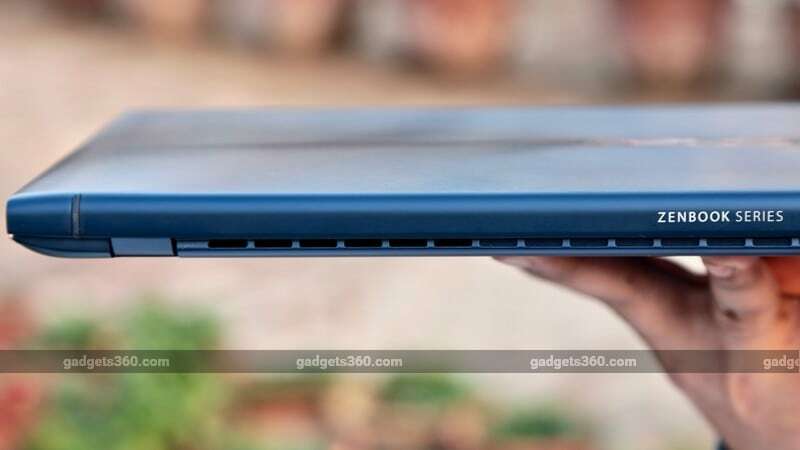 Asus claims that the ZenBook 15 UX533F's SSD offers the fastest sequential read and write speeds in its segment, and we were mighty impressed by its actual performance. 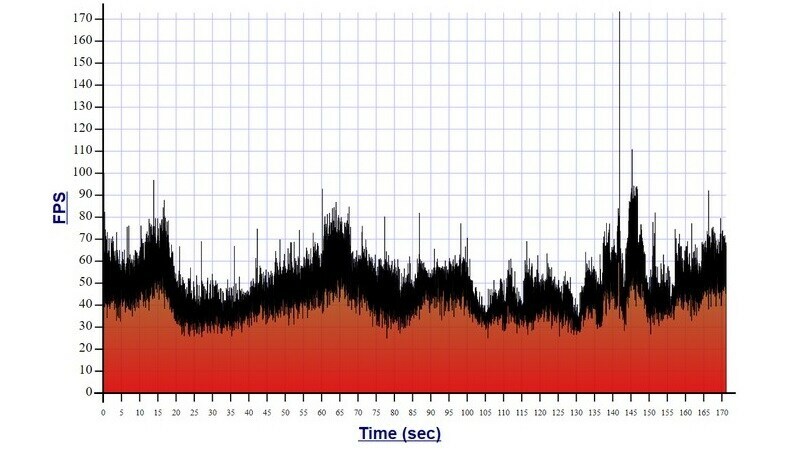 Using CrystalDiskMark, we recorded sequential read and write speeds of 3467.8Mbps and 2294.0Mbps respectively. Coming to the more graphics-intensive side of benchmarking, the premium Asus laptop scored 1,695 in the 3DMark Time Spy test, 4,502 in Fire Strike, and 538 in Fire Strike Ultra. The Nvidia GeForce GTX 1050 GPU (Max-Q) is not particularly well suited to high-end gaming, so it wasn't surprising that the ZenBook 15 UX533F could only manage an average frame rate of 26fps when using the High (default) graphics preset at full-HD resolution in Far Cry 5. Lowering the graphics preset to Medium at the same resolution slightly upped the output to 29fps. In Deus Ex: Mankind Divided's in-built benchmark, the device averaged 28.2fps using the High graphics settings at 1920 x 1080. The ZenBook 15 UX533F fared much better in Metro: Last Light Redux, reaching an average frame rate of 47.06fps at full-HD with the graphics cranked up to the Very High preset. Needless to say, the ZenBook 15 UX533F is not the ideal device for gaming if you want crystal clear visuals and buttery smooth frame rates in AAA games, but it is not targeted at gamers. You'll be able to enjoy these games at lower quality settings, and more casual titles should run much better as well. Coming to battery life, the ZenBook 15 UX533F's 73Whr Li-polymer battery easily lasted through a day of basic productivity tasks that included typing multiple articles, looking up information online, and watching a few videos on YouTube. Through a complete work week, we got an average of 8 hours, 20 minutes of battery life with regular usage on the ZenBook 15 UX533F with the brightness set at 50 throughout. At Rs. 1,39,990, this high-end Asus laptop goes head-to-head with some very capable devices from established brands including Apple, HP, and Dell, all of which have cultivated high brand value and have earned trust from the target audience. The ZenBook 15 UX533F is somewhat of an alternative choice, and convincing buyers to spend so much might be an uphill task for Asus. Ultimately, it will be up to customers to decide whether they want to take a leap of faith with what's clearly an excellent machine. product Asus ZenBook 15 is a premium offering from Asus which features powerful hardware coupled with a sleek design.